Bob Jepson has uncanny vision. That’s what they say, the people who know him. He sees around corners, sees so well that he’s never failed in business, by his recollection. But right now, Jepson is using his telescopic sight to get from the Georgia Ports Authority, where he is chairman of the board, to the Telfair Museums, where his largesse has transformed the cultural heart of Savannah. This is his city. He knows all the routes between here and the historic district, picks one that avoids the endless line of trucks (which smell like money) going to and from the Port of Savannah. He blends in with the busy, moving lunchtime traffic. It’s more cluttered than midair, but a lot easier than flying a P-51 Mustang. “You crawl into one of those monsters, you better put your game face on, because there’s no screwing around. The Mustang is intolerant of mistakes. You make a mistake in one of those, and you’re in for a really bad day,” says Jepson, who hasn’t had many bad days and used to own four Mustangs (the American fighter planes that helped win World War II). He once took Sonny Perdue on mock strafing runs along the Georgia coast, 50 feet up at 400 miles an hour. You can almost imagine the former governor making machine gun sounds with his mouth, like a kid. “You want to talk about fun,” Jepson exclaims. Of course it was fun. The guy thrives on risk. He parks in back of a bank where he is a shareholder, just down the block from the Jepson Center, the $24.5-million, architecturally stunning (and daring, especially for the historic district) expansion of the Telfair Museum of Art. “The name wasn’t my idea,” mutters Jepson, 70, Georgia Trend’s 2013 Most Respected Business Leader, whose current “job” as chairman and CEO of Jepson Associates mainly involves managing his family’s money and giving it away. Through his ultra-private corporation, Jepson and his small staff administer the Jepson Foundation and manage investment portfolios for a few friends – nothing much, he says, making it clear that its none of your business who these friends are and what they’re invested in. Anyway, it’s a long way from the days when he built Fortune 500 corporations, acquiring flagging companies, making them better, then selling the whole thing for big money. Jepson Associates is the launching pad for everything he does in faux-retirement, including big-time philanthropy and helping to guide some of the most influential and respected commercial, educational, nonprofit and governmental institutions in the Southeast. It’s all part of Jepson’s campaign to build a sustainable legacy, because he wants to be remembered for a long time, but not as the guy who got rich from reviving stagnant companies. “Nobody remembers that guy. That guy’s a blip on the radar,” Jepson says, and though he is a son of Virginia, he sounds like a Midwestern baseball play-by-play guy – all those years in Chicago, probably. Such as art and community and economic development and especially education. The Jepsons – Bob and Alice, his wife of 49 years – have been giving a lot of their money and time and creativity to schools and educational programs on both coasts for more than 30 years. He came to town with a fondness for bigger pictures. “Before Bob got to Savannah, we used to think a capital campaign to raise $2 million was a major undertaking,” says John Cay III, longtime Savannah businessman whose family has deep roots in the city and who has partnered with Jepson – with Jepson in the lead, that is – on several eight-figure fund-raising campaigns. Jepson says he was never dirt poor, but he remembers hunger, remembers skipping meals when there wasn’t enough to eat, growing up in his mother’s and grandmother’s care in the Fan, a neighborhood of row houses in the West End of Richmond, Va.
“Hunger is a great motivator,” he says. Hunger is at the root of what drives him, a major reason why he threw himself zealously into college. Thanks to good grades in high school (where he met Alice), he earned a scholarship to the University of Richmond from a local businessman, helped pay the rest of his way through jobs at a gas station and an insurance agency, graduated in three and a half years, and didn’t sleep often, serving as president of the student government, president of ODK (the prestigious national leadership honor society), participating in ROTC, making the dean’s list and being honored as the outstanding business school senior (Class of 1964). If Jepson wasn’t born to lead, it was a natural inclination by the time he left Richmond. He wasn’t bound to be anyone’s employee for too long. After graduation and an obligatory two-year hitch in the Army (served in Huntsville, Ala., as an MP), he did a short stint in a Virginia bank holding company, then moved to California, taking a job as the No. 2 guy in the finance department of Birr Wilson, a brokerage house based in San Francisco. Then he formed his first business, California Capital, and moved to Southern California, where he raised money for young, expanding companies, like Hobie Cat (still one of the world’s leading makers of catamarans). A lot of other people were noticing. Jepson was recruited by Continental Illinois National Bank and Trust Co. of Chicago (and later by the First National Bank of Chicago) to establish merger and acquisition departments. So he moved Alice and their two sons, Scott and Steve, to Chicago. In his spare time, while packaging different deals for the large Chicago commercial banks, Jepson started building a personal business empire. In 1983 he bought two eyeglass lensmakers, sewing up 50 percent of the U.S. market. That same year he bought Emerson Quiet Kool, a company that made window air conditioner units (owned at the time by Swedish company Electrolux), with 800 employees at its New Jersey plant. Like the lens companies, Jepson acquired Emerson though some creative capital structuring, and a lot of faith on the part of the Electrolux president, Hans Werthén. “I had maybe $50,000 to my name. So I told [Electrolux] I planned to borrow as much as I could against the assets of the company, you know, 80 percent of the receivables, 50 percent of the inventory, and I asked them to carry the balance of the purchase price, about $25 million, on a subordinated note for seven years,” he says. “And they said, ‘We can do that.’ Just like that. Boom! That was the beginning of Jepson Corporation, the holding company he built with very little of his own money, using leveraged buyouts – a lot of debt and well-considered risk. Plus, he had that vision going for him. “He took Jepson Corporation from zero to over $750 million, because he could see businesses not for what they were, but for what they could be,” says Vern Nagel, who started working with Jepson in 1985 and spent years with him before moving in 2001 to Atlanta-based Acuity Brands, the $2-billion NYSE lighting equipment company, where he’s been chairman, president and CEO since 2004. Over a six-year period (1983-89), Jepson Corporation bought 19 companies, all of them oligopolistic market leaders, and Jepson held most of the cards – about 81 percent of the stock – and they were all aces. Jepson Corporation made Forbes’s list of fastest-growing companies (No. 5 in 1987); a Fortune 500 firm, it was built from a diverse collection of manufacturers, with 8,500 employees, closing in on $1 billion in sales. Jepson was 46 when he sold the company in 1989 for about $230 million. Jepson planned to spend the rest of his life engaged in philanthropy, especially related to education. He’d served on the board at Gonzaga University (Spokane, Wash.) at the invitation of a friend and ponied up enough cash to build the Jepson Center (which houses Gonzaga’s business school). He and Alice also supported Hamline University in St. Paul, Minn., and a few others. But mostly, they have become Mr. and Mrs. Claus for schools in Savannah, and especially at the University of Richmond, where the Jepson School of Leadership Studies (in Jepson Hall) opened in 1992. It was his brainchild, a school dedicated to the academic study of leadership, and he donated $20 million, raised another $30 million. He’s given millions to SCAD (“generously and graciously,” Wallace says), led a $12-million fund-raising campaign for Savannah Country Day School and started the Savannah Educational Alliance, a program that awards fully funded college educations (including room and board, a computer and spending money) at Savannah State University for six local public school students every year. Jepson says they plan to expand that program, and he believes that his support of education, especially the creation of an institution for leadership at his alma mater, is his best investment in a kind of immortality. So philanthropy was pretty much all Jepson expected to do when he became a full-time Savannah resident in 1989. Well, that and maintain the 1,400-acre California vineyard he and Alice bought in 1985 (they’ve since sold it) and enjoy his toys. He has two Czech-made L-39 fighter jets, a helicopter, a Cessna Citation X (but that’s just for business, and he doesn’t fly it) and a single-engine Cirrus SR22. He sold the Mustangs, one of his few concessions to age – “that’s a young man’s plane,” he says. But Jepson wasn’t quite through with business when he moved to Savannah, not by a long shot. He bought, turned around and sold Coburn Optical Industries, an Oklahoma-based company that made machinery used in fashioning eyeglass frames. Then there was Kuhlman. That phone call came in 1993. “It was an investor banker friend. This was an NYSE company in Lexington, Kentucky. They made transformers for the electric utility industry, and my friend said there were problems with the CEO, they really wanted to sell this company,” Jepson recalls. They made Jepson chairman and CEO, and he moved the corporate headquarters to The Landings outside Savannah. In six years, a company with a $75-million market cap became a billion-dollar enterprise, mostly through smart, timely acquisitions. It was like someone handed him another Jepson Corporation and said, “Here, go have fun.” He did, and a lot of people made a lot of money when he sold the company in 1999. 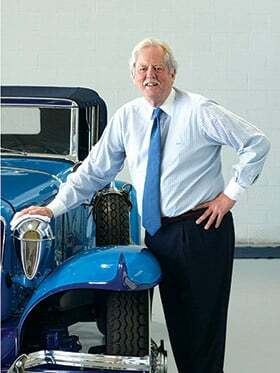 Jepson figures that in his big three corporate ventures – Jepson Corporation, Coburn and Kuhlman – he’s helped make 40 millionaires, most of them several times over. It’s because he’s always had a knack for getting the buy-in, whether he’s doing business or building consensus in a boardroom or raising money to build a museum or college. “He’s got this ability to inspire people and get them to share his vision, get them to become better than they’d envisioned, and I’m living proof of that,” Nagel says. And there’s never a question about who is in front. “He has a very direct leadership style, and when you’re at the table with Bob Jepson, you absolutely know who is leading the organization,” says Curtis Foltz, executive director of the Georgia Ports Authority, where Jepson is nearing the end of his term as chairman. Jepson is vice chair of the Savannah-based Georgia Historical Society and has led the group to unprecedented levels of sustainability, reviving the Georgia Trustees program (and its annual gala, which has become the society’s top fund-raising event). He’s also invested plenty of his money and time in Savannah, because he adores the city, says he’ll die there. He has a plantation over the state line in South Carolina, a mountain place in North Carolina. But Savannah is home. This is the city he serves. He’s on the board of the Lucas Theatre, and he started the Board of Visitors at SCAD, where he led the $20 million-plus fund-raising campaign for the SCAD Museum of Art and serves on the endowment committee also. The Jepson Center may also distinguish him, and the commitment he and Alice have made to the city’s cultural landscape. It was Jepson who wrangled Cay and another longtime Savannah businessman, Arnold Tenenbaum, to help raise the money. The building was designed by world-renowned architect Moshe Safdie, who compromised with an adamant historic review board and designed a 64,000-square-foot masterpiece – white and glass, crisscrossing shadows, a contemporary structure existing seamlessly with the local history, a modern art palace. “This one sets the standard for 21st century architecture in Savannah,” Tenenbaum says. At the top of the grand staircase, Jepson remembers the museum’s 2006 opening, when he asked Safdie how he’d ever top this, and the man broke down in tears. Jepson gets quiet then, and we stand a moment at the top of the staircase in a building named for him, and you can look out through six-story windows, at the treetops of Telfair Square, but you get the idea that Jepson is looking a bit farther.